As truck manufacturers begin to add electric-powered models to their product lineups, they are targeting city and regional routes as early applications for these vehicles. Daimler Trucks expects that urban and local distribution will serve as the first use-case for large electric-powered trucks. “We see applications with dedicated, predictable routes such as local and regional distribution as well as drayage as good fits for heavy-duty electric vehicles,” said Carola Pfeifle, a spokeswoman for Mercedes-Benz Trucks, part of Germany’s Daimler AG. Freightliner and Western Star trucks are manufactured by Daimler Trucks’ North American division. Pick-up and delivery, food and beverage distribution and last-mile logistics are good fits for heavy- and medium-duty electric vehicles, Pfeifle said, noting several applications lend themselves to battery-electric technology, specifically those on shorter routes with reliable access to charging stations. At Navistar Inc., the focus is on distribution in urban applications where routes and payloads are predictable and the journeys are relatively short. “It is either going to be in load diminishing where the vehicle starts out fully loaded and returns empty, or the opposite, where it starts empty and returns fully loaded,” said Darren Gosbee, vice president of powertrain and advanced technologies for Navistar, parent of the International Truck brand. “The low-hanging fruit for commercial EVs are vehicles that are short-mid range that return to a central hub at the end of a shift,” said Giordano Sordoni, co-founder and chief operating officer of Thor Trucks, an electric-truck startup based in Los Angeles. A recent report by the North American Council for Freight Efficiency projected that early adoption of electric-vehicle technology within the commercial vehicle industry will be in the Classes 3-6 segment. NACFE’s report also found that longer ranges and heavier weights in Classes 7 and 8 are possible in specific operations, but will not be viable in all roles. “I believe that the biggest near-term fuel savings are with Class 7 or 8 dedicated regional-haul tractors with a 200-to-300-mile range. There could be an earlier than currently thought adoption there,” said Mike Roeth, NACFE’s executive director. Thor Trucks’ Sordoni said the infrastructure required to grow the longhaul segment is trickier and therefore could take a little longer. For UPS Inc., which has pre-ordered 125 electric tractors from Tesla Inc., urban and local distribution serve as the first use-case for electric heavy trucks due to the higher density of stops and the presence of traffic signals. Tesla has said its all-electric tractors will be available in 2019. In addition to investing in Tesla vehicles, Ryder System Inc. has ordered hydrogen-electric hybrid Class 8 tractors from Nikola Motor Co. Nikola has said it will begin field tests with fleets around the fourth quarter of 2018 — with production coming in 2021. UPS, which ranks No. 1 on the Transport Topics Top 100 list of the largest for-hire carriers in North America, believes that urban routes for Class 8 electric vehicles would have an entry-level range limit of about 250 miles to start with and fewer miles with more starts and stops. “In a delivery-and-pickup service, we expect electric vehicles to be able to perform the same job as our conventional vehicles do now without any loss of our service capabilities within the range limits of existing electric-vehicle technology,” Jordan said. Chris Nordh, senior director of advanced vehicle technology for Ryder, said last-mile application is ideal for electric motors. “The amount of range these vehicles need is within the reasonableness of battery power today, so this area will be conquered first,” he said. Nordh predicts that retailers that deliver goods, as well as larger packaged-goods companies, will be among the first to convert their vehicles, shops and distribution centers to an electric model. “You can continue to move up in the class size from those delivery vehicles,” he said. Ryder’s Supply Chain Solutions unit ranks No. 13 on the TT Top 100 list of for-hire carriers. In heavy-duty trucks, diesel engines don’t work as well in last-mile deliveries because engine temperatures don’t get high enough for the aftertreatment systems to naturally regenerate, Nordh said. “You’re forced into these scenarios where you have to pull over and do a forced regen. That is very inefficient,” he said. Thor Trucks is pursuing electric offerings for shorthaul and day-trip delivery trucks that travel fewer than 300 miles a day. Sordoni said optimal applications include vocational trucks with shorter ranges, such as local delivery or refuse, which have regimented, predictable routes. Ryder’s Nordh said there are several niche applications where electric vehicles make sense, such as mountain ranges. “That electric motor has plenty of torque, so you can do it at a faster speed than with traditional diesel and on the way down, you’re regening the entire time,” he said. In addition, brake regeneration will mean a driver isn’t wearing out or heating up brakes on the way down a hill. “You have a much greater safety scenario running with these trucks,” Nordh said. Electric vehicles also have the potential for power export capabilities, which is useful for some industries. Navistar’s Gosbee said utilities are interested in electric propulsion for bucket trucks so they can use the vehicles quietly and avoid idling while operating the lift. Andrew Cullen, senior vice president of fuels and facility services for Penske Truck Leasing, said Penske’s customers are looking at electric vehicles for a variety of reasons. These include cutting costs and meeting sustainability goals. “The noise and environmental reduction of emissions is a general theme that we hear from localities and municipalities,” Cullen said, who spoke earlier this month on alternative fuels at the Advanced Clean Transportation Expo in Long Beach, Calif.
Penske offers a mix of light, medium and heavy-duty electric trucks and buses to its customers, and offers contract maintenance on electric vehicles. Keith Brandis, vice president for product planning at Volvo Trucks North America, part of Sweden-based Volvo Group, said the low noise level and vibration-free operation of electric vehicles improves the working environment. Manufacturers are rolling out several options for fleets. 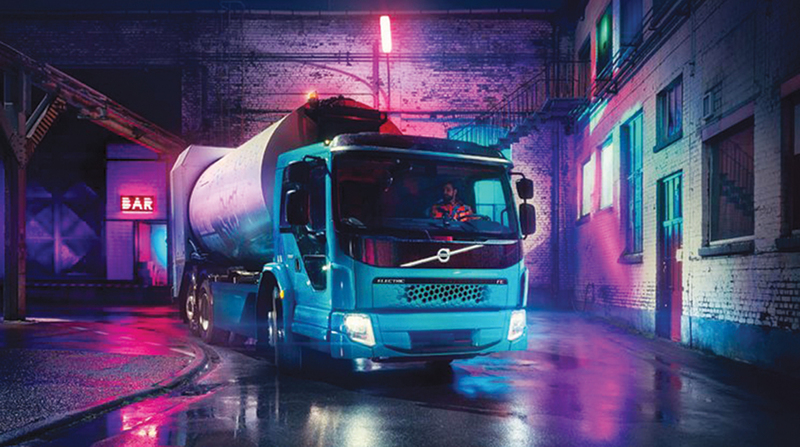 Volvo Trucks recently introduced two all-electric trucks for the European market, the Volvo FL Electric and the Volvo FE Electric. Sales of the vehicles are set to begin next year. “This opens the door to new forms of cooperation with cities that target to improve air quality, reduce traffic noise, and cut congestion during peak hours since commercial operations can instead be carried out quietly and without [tailpipe] exhaust emissions early in the morning or late at night,” said Claes Nilsson, president of Volvo Trucks, in a written release. The first Volvo FE Electric, a refuse truck with a superstructure developed with Faun, Europe’s leading refuse collection bodybuilder, will start operating in early 2019 in Hamburg, Germany. Mack Trucks, also part of Volvo Group, plans to have a fully electric Mack LR refuse model equipped with an integrated Mack electric drivetrain operating in North America in 2019. The New York City Department of Sanitation will test the demonstration vehicle, which could help it reach its goal of 80% reduced emissions by 2050, said Rocky DiRico, DSNY deputy commissioner. In February, Mercedes-Benz introduced the eActros, which is the production version of the Mercedes-Benz Urban eTruck concept the company announced in 2016. Mercedes-Benz said 10 vehicles will be handed over to customers who will test them for 12 months. The fleet-testing focus will be on inner-city goods transport and delivery services, and Mercedes-Benz Trucks will gain insights about different ranges, routes and use patterns, Pfeifle said. Late last year, Mitsubishi Fuso Truck and Bus Corp., also part of Daimler Trucks, launched the FUSO eCanter, an all-electric, light-duty truck. The company said UPS was its first customer and supplied a fleet of FUSO eCanter trucks to several New York-based not-for-profits. The all-electric light-duty truck is Mitsubishi Fuso’s answer to the public’s need for a local zero-emissions, zero-noise truck for inner-city distribution, the company said. Navistar has said it plans to offer a Class 6-7 electric truck in late 2019 or early 2020, but the company doesn’t see traditional, coast-to-coast linehaul Class 8 operations as being well-suited to electric propulsion due to the weight of the batteries, Gosbee said. Meanwhile, Penske’s Cullen said there are several factors to consider when calculating the costs and benefits associated with electric vehicles, such as the cost of the infrastructure and any incentives to offset those costs. “There is a capital investment as well as a charge for the electricity,” he said, adding that fleets also must factor in how many out-of-route miles a driver might have to travel to get to a charging station. Although electric vehicles require a larger capital outlay, fleets can benefit from decreased maintenance costs and a longer life, Gosbee said. Removing the internal combustion engine reduces the number of components that need to be maintained, and the brakes last longer due to regenerative braking technology. Plus, electricity prices make the main fuel source less expensive than diesel and the trucks don’t need diesel exhaust fluid. As for professional drivers’ views, Cullen said Penske saw that they valued natural gas vehicles because they are quieter. He expects to see the same with electric vehicles. “With the driver shortage and the challenges of freight capacity, getting and keeping drivers is so important,” Cullen said. In addition to fleets reinforcing that they want to be part of the “green” movement, the federal government’s Phase 2 greenhouse gas regulations encourage manufacturers to offer electric vehicles.